Everyone can agree there’s something special about a small business done well. Maybe it’s how they know you on a first name basis, or perhaps the personal touches. But whatever the case may be, we want to remind you that we’re a small business and we do gifts and Champagne very well. Everything at Fat Cork is done by hand and that allows us the personal touches and creativity that simply can’t be achieved on a large scale. So when you’re thinking about where you want to shop, please think about us. We promise you’ll enjoy the sipping and the giving! Only one year ago, the very first generation of Magnums arrived on the shores of America just in time for a Thanksgiving toast. Soon after, the exuberant popping of corks could not be ignored by their cousins still in France. 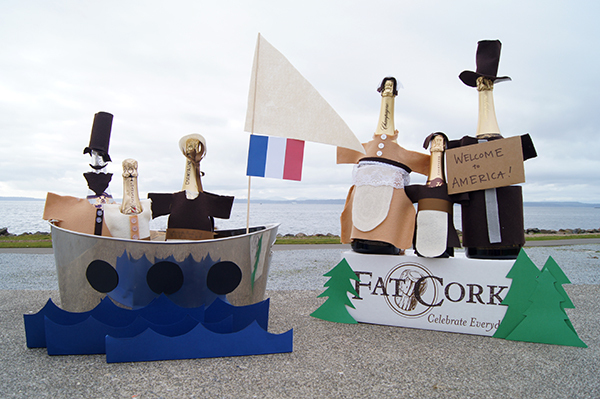 Convinced America was the perfect new home for their celebrations, the next generation of Magnums boarded a ship and crossed the Atlantic to join the party. Please welcome the new Magnums into your home and celebrations. These pilgrims aren’t shy: perfect for a party of four, suitable for a party of eight, and sublime for a party of two!